OutBack G-Series inverter/chargers are the grid-interactive versions in OutBack's FX inverter line. 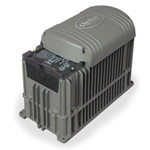 Available in either sealed (GTFX) or vented (GVFX) models, these inverters allow you to sell solar, wind, and/or hydro power back to the utility grid. If the utility power goes down, the inverter will automatically switch to battery power and your renewable energy source(s) to run your critical loads. The inverter can be set up so that either utility power or your renewable source can be used after an outage to recharge the battery bank. AC power is seamlessly switched between utility and battery power through the inverter's built-in 60A transfer switch. With the OutBack grid-interactive system, backup AC power is made available 24 hours a day in the event of a utility outage, providing reliable power and peace of mind. At night, the inverter's automatic power save mode ensures that energy is not wasted by needlessly charging your batteries from the utility grid. Daily energy production efficiency is within a few percentage points of batteryless grid-intertie systems (depending on the condition of the battery bank). Up to two G-Series inverters can be combined and wired or "stacked" for 120/240V output. 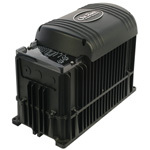 G-Series inverters can be stacked in Classic Series only, which is limited to two G-Series inverters. They come with a standard 2-year warranty with an optional 3-year extension (5 years total). A 10-year warranty is available for California residents. ETL Listed to UL 1741 for U.S. and Canada. OutBack GTFX-LA and GVFX-LA grid-tie inverters are designed to be used in Mexico and other parts of Latin America where the grid power is uneven. They have 127VAC/60Hz output, and have widened grid input voltage and frequency ranges to work better with the Mexican utility grid. As with the other OutBack inverters, the "T" models have a sealed chassis and an external cooling fan, and the "V" models have a fan-cooled, vented chassis. NOTE: OutBack LA inverters are NOT ETL Listed to UL 1741. NOT intended for use in the U.S. or Canada.